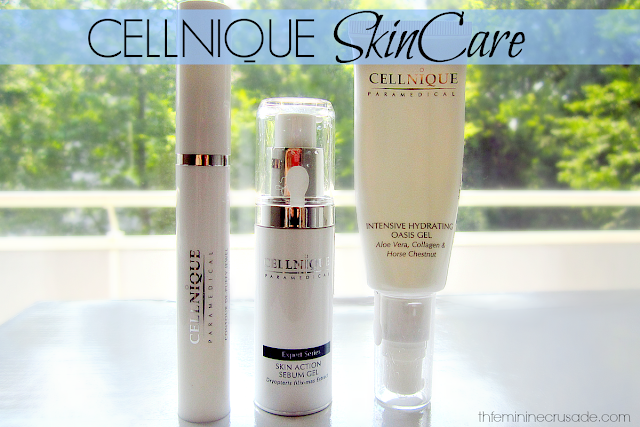 A while back I was contacted by Cellnique to review some of their skincare products. Helen very sweetly did my skin analysis through emails and sent me these three items based on my skin problems. I have been using them very religiously (minus a day or two of laziness) for a month. 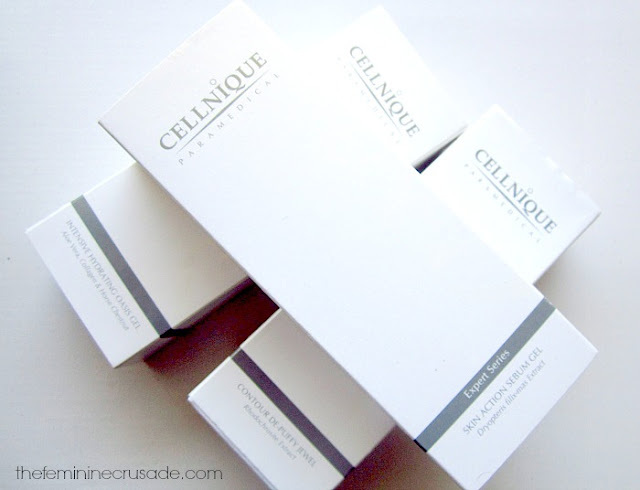 Cellnique is a brand that deals specifically in problem skin. In their own words "All Cellnique Paramedical products are infused with Cx Formulation. This advanced in-clinic formulation combines the power of biologically active ingredients, natural plant extracts, antioxidants and a bio-active delivery system, offering immediate and visible results for various skin problems." With its unique combination of Acetyl Tetrapeptide Gold Dipeptide and Rhodochrosite Extract, this formulation lifts away eye puffiness and dark circles by increasing blood circulation and providing deep moisturizing around the eye area. 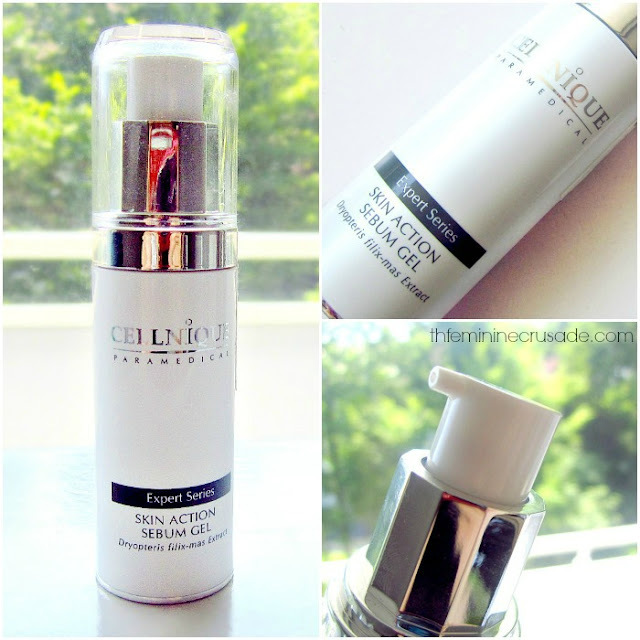 Designed with a SPF level of 15 it protects skin from those harmful aging UVA and UVB rays. Well, I am sure you all are familiar by now of my issue with my panda eyes. So if a website deals with skincare and has an eye care product for brightening under eyes I am sure to go after it. 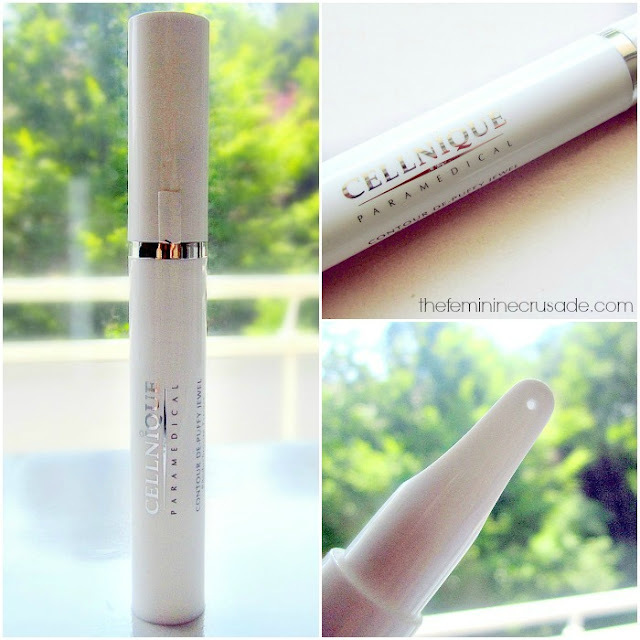 The eye serum comes in a sleek, luxurious long tube with 15ml of product. The packaging of this eye cream is very different from all others, with its round pointed tip and press system to disperse the product, quite unique and handy. The serum is of a very gel like consistency, which has a very refreshing slight cooling sensation on application. It feels so smooth when applying and absorbs instantly, hydrating my under eyes yet not at all greasy. It is a day and night eye gel , without a doubt. As for its performance, it definitely is very moisturising, has SPF, feels refreshing and makes me look awake. I don’t have fine lines or wrinkles so cannot attest for that. But my dark circles, sadly they are about as bad as they were a month back, there could have been a 5% lightening but that could also be because of so many other factors. Still, I will continue to use the serum till I run out of it and maybe I can see a better improvement in a three-month time. If I do, I will update this post. This is a phyto bio-engineering formulation gel for all skin types, designed to reduce both blackheads and whiteheads on affected skin area without painful extraction. This daily maintenance gel also reduces sebum secretion, leaving the skin clear, with smooth visible results within 10 days of application. This gel comes in a 30 ml pump bottle, very convenient again. It is to be applied on the t-zone and congested area to treat blackheads/whiteheads. I do experience slight acne sometimes, which is not massive but who doesn’t like a clear skin. So I apply this around my cheeks and on my t-zone. It is a clear gel that feels tingly and tightening in a pleasant way. I won’t say it worked miracles in 10 days, but yes over the period of time, combined with a good skincare routine, my cheek area have become a whole lot smoother and clearer. I don’t see many pimples sprouting now and if one or two decide to rebel, this gel treats them overnight. Although if you bad acne and spots, it might work too, but my skin can’t be the judge of that. For me, it made my skin clear, what else could I want. A highly concentrated Aloe Vera moisturizing gel, with soothing and calming properties designed for all skin types. This soothing gel is further enhanced with the infusion of Witch Hazel, Horse Chestnut, and Marine Collagen to deliver an ultra effective moisturizing effect. This moisturiser is a 50ml pump tube, I really like their pump systems. This moisturiser also has a clear gel like consistency, which I work all over my face in outward circular motions. Of all my moisturisers the good and the bad ones, this is the one I’ll always pick because of its SUPER comfortable and weightless feeling. A moisturiser you don’t even feel on your skin, no heaviness, no creaminess yet so hydrating. I don’t see even a single patch of dryness after using it and now when its summers and somewhat hot and humid, there is still no greasy feeling or break outs. And it is completely odourless, meaning good for sensitive skin. All three of these products do not have any scent at all. I honestly LOVE this moisturiser Yes, it is expensive, but if I invest in a skincare product it would either be an eye cream or a moisturiser. 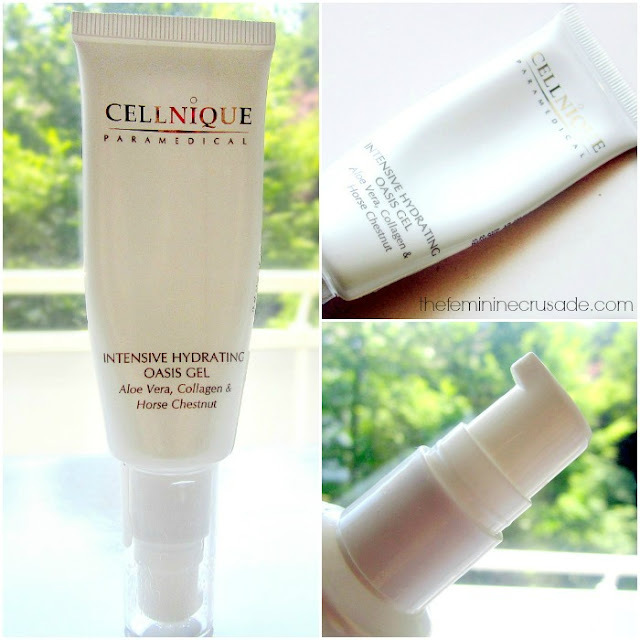 On a whole, I am really impressed with Cellnique’s skin care range and their sleek, luxurious-looking packaging, though yes their prices are a bit steep. To check out these or more of their products head over to their website or get updates on Facebook or Twitter. They have a skin diagnosis system and a whole ingredient glossary on their website. Also they promise a refund in their 30 days assurance policy if for some reason their products could not live up to the claims.